Reliable power for all your USB devices. 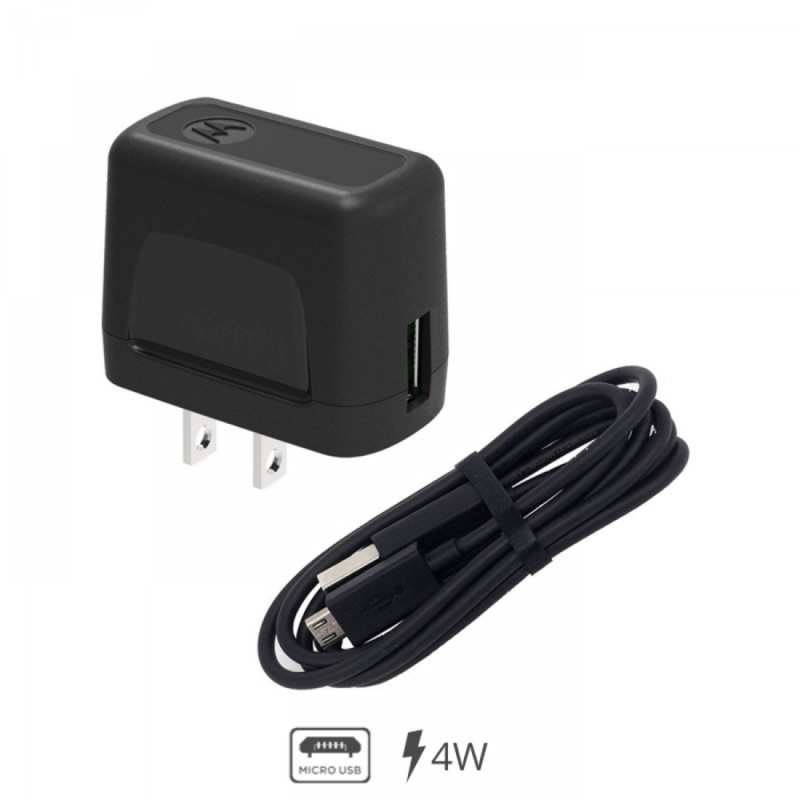 Motorola 4W USB wall charger with micro-USB data/charging cable is designed to work with a variety of mobile phones and accessory devices that charge via USB. • Reliable Travel Companion. Motorola original accessories, perfect for travel. Portable, compact design makes this a perfect charging companion when you're on the go. • One for all. Charge any micro-USB enabled device including mobile phones, bluetooth and other accessories. • Charge safely and high energy efficiency. Charge safely and efficiently. With UL certification and Level V High-Energy efficiency, you can be confident that you're device is charging safely and efficiently. • Includes a detachable micro-USB charging cable. Durable, 3ft Motorola SKN6461A USB A to micro-USB data/charging cable for both power supply and data transfer for your compatible smartphones, tablets, digital cameras and more. • Warranty Brand new including manufacturer's warranty. Does it with work with Moto G4 Play? Will this charger work with the Motorola TX500 blue tooth device? Yes. Any Motorola charger with the correct micro-USB tip will charge Moto phones that have micro-USB ports. However, this charger does not support TurboPower charging and will charge at the lower speed. For TurboPower enabled micro-USB devices, we suggest using Motorola TurboPower 15 Micro-USB Wall Charger (SPN5864B) or Motorola TurboPower25 Micro-USB Wall Charger(SPN5886A) for fast charging.